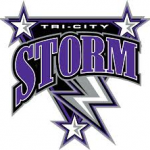 The Tri-City Storm will play their final road games of the regular season this weekend, closing out a six game road swing in Sioux City and Cedar Rapids, Iowa. Last week the Storm set a franchise record for most wins in a regular season, with 44, and clinched the Anderson Cup. They’re now just six points away from tying the USHL record for most points in a single season. The current record of 98 is held by 2011-2012 Green Bay Gamblers and the 2012-2013 Dubuque Fighting Saints. The Storm are also four wins away from tying the USHL league record for the most wins in a regular season set by the 1998-1999 Des Moines Buccaneers. The Storm will close the regular season on their home ice next weekend with games against Des Moines and Sioux City.